We can train your dog or puppy in your own home. No results no fee! Call us on 0433 364 364. If you’re a single or multiple dog owner struggling to obtain harmony between animal and human, please know this: You’re lack of success is NOT because you’re not attending the latest hip puppy school, Obedience classes……Or watching the latest guru on TV…Or because you’re not spending enough time surfing the net looking for real advice that works. The success you desire is being stunted by something very simple and easy to solve. There is no magical enchanted way to training dogs, although some do call us dog whisperers. THE SECRET: Communicating with your dog in a way that resonates and motivates them into action. Basic dog obedience is no secret, it’s being given away free of charge on the internet and in thousands of books in libraries. SO WHY CHOOSE SHERLOCK BONES AS YOUR DOG TRAINER? Because we know how to clearly communicate a message to a dog, simple. And we can help you do the same. Where most trainers get stuck (and we’re talking about everyone from green rookie to battle hard veteran) it’s the “communicating your training message to the dog and owners” part. This is why our famously simple home dog training system is all you need. Notice the dog training testimonials from everyday families and individuals to national businesses that work with thousands of dogs. If there is a “magic bullet” for dog training it is simply knowing how to communicate with your dog and helping them understand you’re the one they should be listening to. Fads, gimmicks and gadgets don’t work. The sad fact is most dog trainers are flying blind. They literally are chucking all sorts of training into the jumble such as positive reinforcement, negative reinforcement, barking collars, clickers, toys, squirty bottles and the most alarming getting physical and alpha rolling (scruffing). And whatever else they can think of and praying it works. If you do not understand how to clearly communicate with your dog you will forever struggle. Once you have learned how to communicate via dog training Adelaide you can apply this simple system of communication to every dog you own for the rest of your life. Home is the BEST, and sometimes ONLY, place to teach and gain control so that you can then take that great control out for a walk or to the park etc. This is opposed to putting dogs into chaotic (and sometimes stressful) situations such as groups or being sent away. We see no end of problems from these types of approaches. There is no set program or limit to the number of problems we can address or things that we can show or teach. It is important, but also a bonus, to be able to deal with ALL behaviours. I encourage people to jot down as long a list as they like and we will teach you how to address it all! Call to schedule an appointment that suits you and your trainer. Once at your place we will sit down and confirm what you would like to achieve face to face. Your strategy notes are already done for you. Included in your home training is all the notes from our presentation so you can always refer back to them. Plus You get a personalised training programme tailored to your schedule to ensure the ongoing success with the training exercises laid out. A written lifetime coaching agreement in which you and your trainer will sign. We are here to back you up all the way with ongoing telephone support, It’s simple you don’t have to do anything. When you purchase your first lesson you’ll be automatically registered. We will provide direct, one stop access to telephone technical support for questions about your dogs obedience, behaviour and equipment for the life of your dog. Six foot soft cotton webbing leash- Super soft for hands, and very strong, with tapered clasp for extra safety, sure to become your favourite. Especially considering the time, money, frustration and possibly relationships you will save by training your dog with up to date no fluff training that you will love. There is an awful amount of time wasting waffle in the dog world. We have spent literally many, many tens of thousands of dollars around the globe and countless hours sorting out the quality and waffle devising our unique system so you don’t have to. Your cost for the entire home training programme, with the notes, personalised training programme, leash, and lifetime coaching is just $295.00. We do not charge this per dog – other family dogs with no behavioural issues may join in for free – there is a $75 fee for each extra dog with behavioural issues but then both dogs are covered by the lifetime coaching agreement. If in your first lesson if we do not get a result there is no fee! That’s right no result no fee. You will see exactly how the training will work for you and your dog before you pay for the home dog training package at the end of the first session. 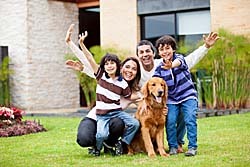 There is ONE very reasonable condition to our lifetime coaching: Follow the simple personalised training programme daily as instructed this ensures the training becomes a habit with your dog, and we will provide direct, one stop access to telephone technical support for questions about your dogs obedience, behaviour and equipment for the life of your dog. This is a very reasonable guarantee, and I hope you clearly understand why we have this single condition. We bent over backwards to create this home dog training course putting everything we know about systematically creating great relationships with dogs. It’s worked for so many people, that I’m betting it will work for you. I’m in this teaching business to help people and dogs. I’ve done my part, by creating this system. All I ask is that you give it a fair go. So we’re invested in the process of making you happy. I want you to feel totally comfortable, so feel free contact us for an obligation free chat or free phone consult to discuss how we may best help.